Well hello out there. I have a brief moment before the computer screen this morning while baby Felix takes one of his notoriously short naps. Now that the sun has finally appeared, you should not expect to hear from us as often as you did this winter and damp spring. We are very very busy, but getting lots of work accomplished. 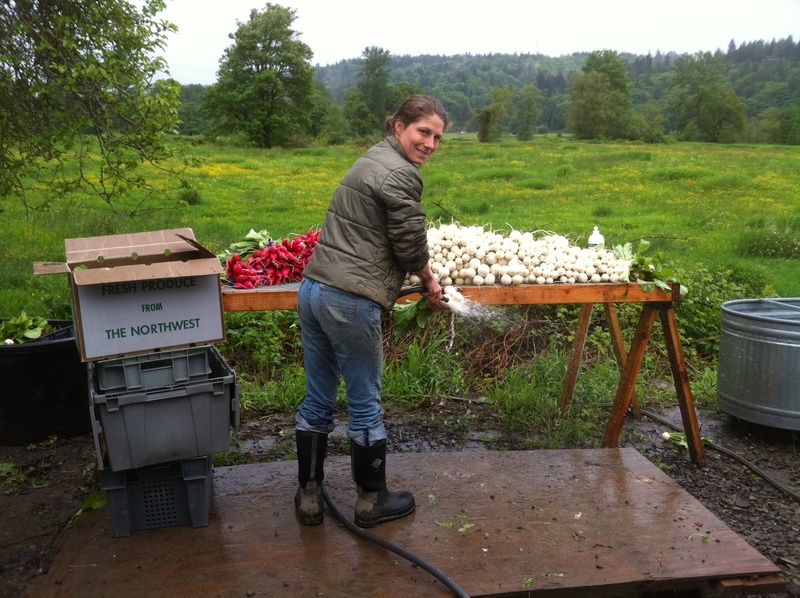 By the middle of June, we are in full harvest and market mode, picking vegetables four days a week for our various markets, CSA, and restaurant accounts. 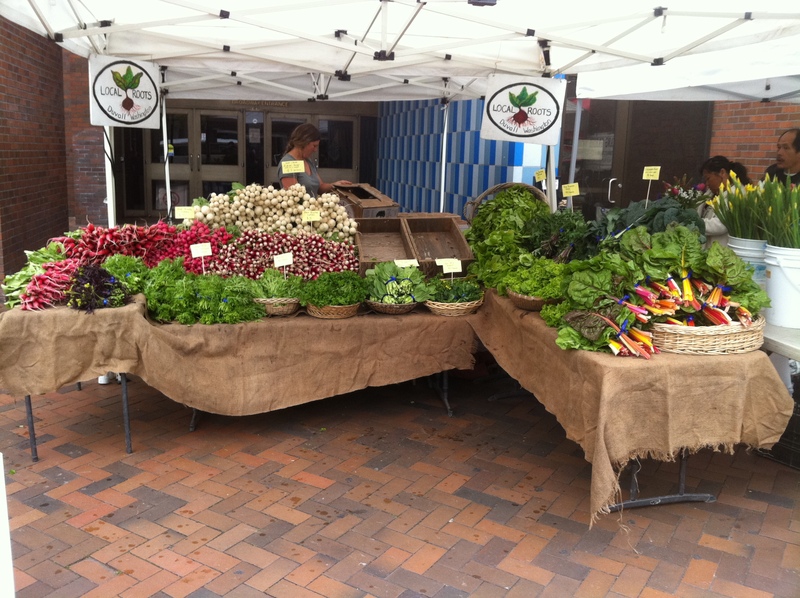 Our stand at the Broadway farmers market, late May. When we’re not busy harvesting, we still have tons of vegetable to seed in the ground and transplant from the greenhouse to the field, and we’re still not done with our weekly chore of seeding trays of lettuce, broccoli, chard, and our big fall radicchio crop. Last week we seeded 90 flats, mostly of fall kale, cauliflower and cabbage. 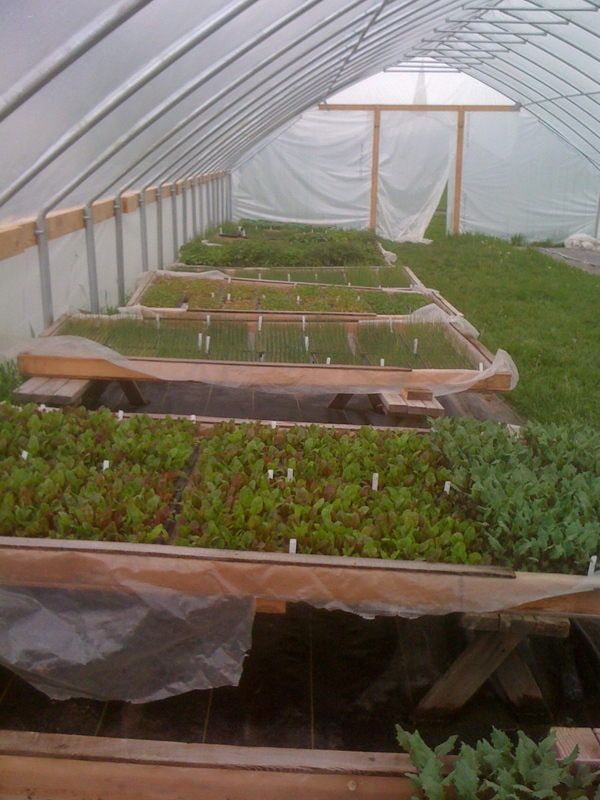 In about three weeks we’ll be ready to transplant them – more than 5000 plants worth just of cabbage family, plus another 4800 lettuce, fennel, and escarole seedlings. Or perhaps I should say that they will be ready to be planted – whether we will be ready to do the planting is another story. June and July are always a crazy time on the farm. The days are long, which is a blessing and a curse. We have so much to do that we’re glad for the extra day length, but when the sun stays out until 9 PM it’s hard to quit working and make dinner before 11! Besides all the planting and harvesting, there’s always weeding, trellising tomatoes, mowing the ever-growing grass, moving irrigation equipment and row cover (keeps the bugs off the crops). So for now, we’ll be doing less blogging, more farming. If you want to see us in person, stop by the farmers market. Here’s our market schedule for this season. You never cease to amaze me with your stories of hard work and productivity. Ditto Tammy! Felix is getting so big. 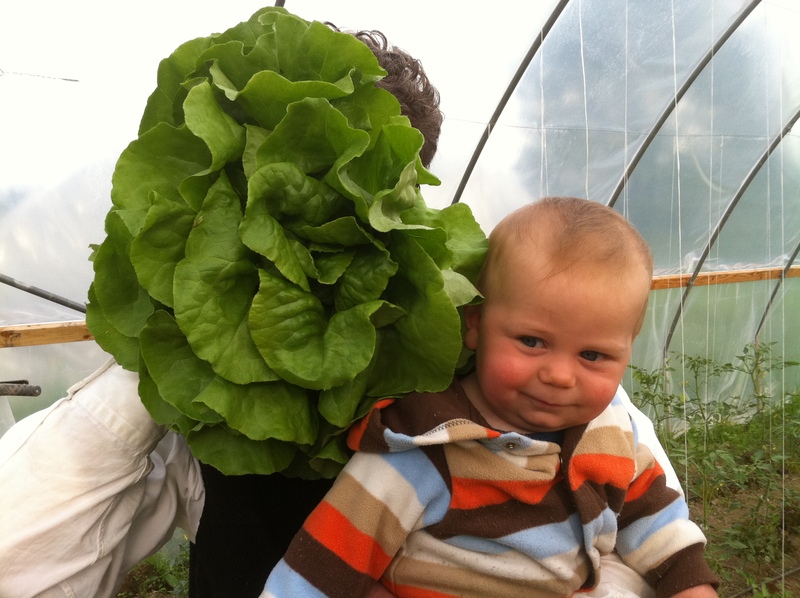 Love snuggling him at the QA Farmer’s Market every Thursday.